How much is your car or van worth? We are the official Toyota dealers for Leicestershire. We have two dealerships in Leicester and Loughborough. As a family run business of 44 years we look forward to sharing with you our expertise, knowledge and a completely refined customer experience to foster and ensure a long and lasting relationship. 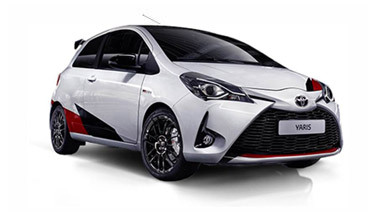 We sell the entire range of New Toyota vehicles including city cars, coupes, sports cars, 7 seaters, estates, hatchbacks, 4x4, vans and pick-up trucks, in a combination of driving trains and fuel types including petrol and hybrid. At any one time we stock over 150 used cars. We don’t just stock used Toyotas, we cover a broad range of marques and models. Each vehicle is comprehensively checked to ensure your peace of mind. Whether you’re self-employed, a sole trader, a limited company, a PLC or a small to medium business our dedicated Fleet and Rental team will look after every aspect of your purchase whether you need 1 car or many. If you already own a Toyota and need to book a Service, MOT or buy parts, we have expert Toyota trained teams – so you can relax knowing that your vehicle is in the right hands. Our Toyota Approved Body Shop has been awarded the BS 10125 standard and is fully fitted with the latest equipment to carry out insurance work, crash repair, full re-sprays and cosmetic repairs. We are the only Toyota Motor Insurance approved Body Shop in Leicestershire. Being involved in an accident can be a stressful experience. That is why we have Body Shop Estimators who can assist you throughout the repair process. Toyota Hybrid Model Video Guide | YouTube collection - FAQ's - available to view now!